« 26 Days in the Trees! Arch Coal is a major perpetrator of mountaintop removal mining and currently holds some of the mountaintop removal mining permits on Blair Mountain, site of the largest labor uprising in US history. 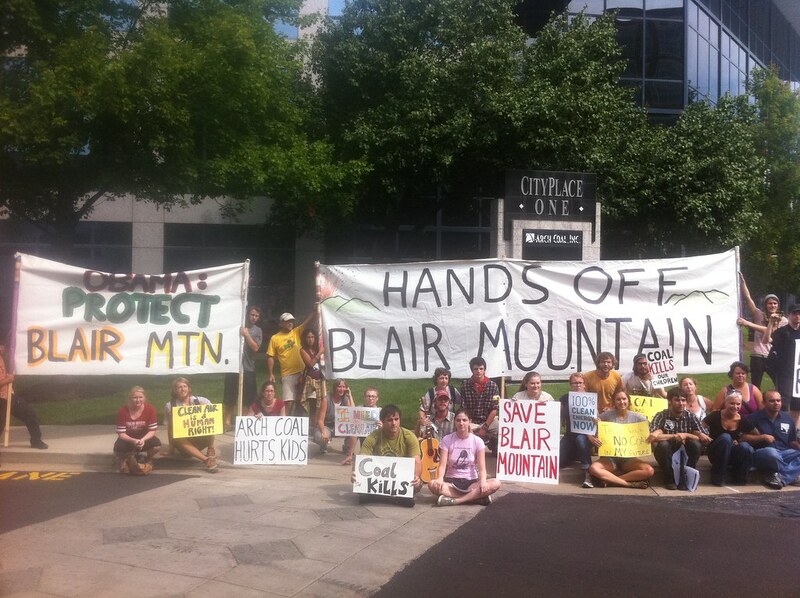 Activists with RAMPS were involved in organizing the 5-day march on Blair Mountain earlier this year. Peabody operates the enormous strip mine on Big Mountain (Black Mesa) in Arizona, on ancestral Navajo, Hopi and Dine lands where tribal members were ordered to relocate by federal law in the mid-1970s. More info on Big Mountain available from Black Mesa Indigenous Support and Black Mesa Water Coalition. Appalachians joined the mobilization in St. Louis to build a regional movement to confront Big Coal and call for economic justice. Tyler Cannon, a coalfield resident from Logan, W.Va., demanded a meeting with the CEO of Arch. Hundreds of people from across the country took to the streets of St. Louis today to stand up to Big Coal and other corporations harming communities and exploiting people for record profits. Another of the corporations targeted was Bank of America, a major financier of mountaintop removal mining. This entry was posted on Monday, August 15th, 2011 at 5:04 pm	and is filed under action, Arch Coal, Blair Mountain, Peabody Energy. You can follow any responses to this entry through the RSS 2.0 feed. You can leave a response, or trackback from your own site.